There is a special kind of data that enables the discovery and consumption of music. It’s called metadata. This article describes two specific ways that services like Spotify, iTunes, Rhapsody, Google Music, and Pandora dramatically underserve the market for classical and jazz music because of the way they treat the metadata for these genres. But first, a little about what metadata is. Metadata is the information that accompanies a sound recording file and is delivered to online stores like iTunes and streaming platforms like Rhapsody and Spotify. Metadata includes things like performer, composer, record label, and release date. In the case of jazz or classical, listing soloists, movement names, conductors, or sidemen can be equally relevant. Aggregators like The Orchard, CD Baby and Tunecore have made choices about what metadata they collect from rightsholders who submit music to their services. Additionally, online platforms like iTunes and Rhapsody have made choices about what metadata they’re going to display when you are listening to music on their services, and, even more importantly, which fields are searchable by users. In the case of jazz and classical music, some of these choices have made these genres less discoverable. 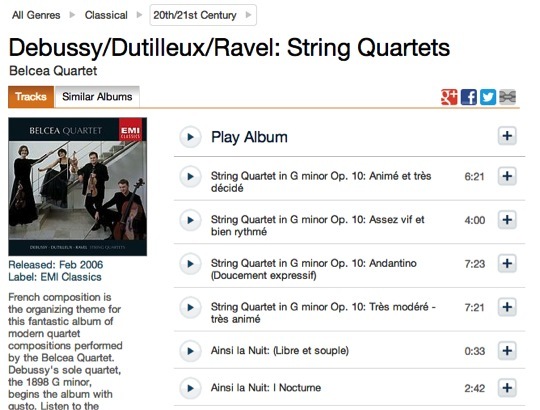 Say you want to find a version of the Ravel String Quartet. That’s Maurice Ravel, an early twentieth century composer. Ravel composed the String Quartet, but he did not perform or record it (he mostly stuck to composing). This piece is performed regularly by string quartets and dozens–if not hundreds –of string quartets have recorded this piece over the years. This is a recording available for purchase on Google Play. Note the problems. First, you have to look at the album art to figure out who performs this particular version. That’s because the “Artist” column displays the composer’s name, and not the performer. By choosing to have one displayed column of information called ARTIST, Google Music is lumping together composer and performer. But for classical fans, it’s important to identify both the composer and the performer, as the distinction is critical. Seeing this flaw makes me think about the possible root causes. Maybe it’s because the aggregator submitting the album to Google Play for sale in the store was confused by Google Play’s use of the term “artist”. 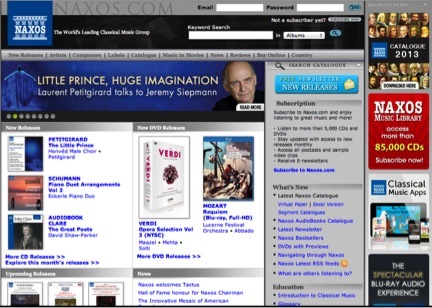 But this is highly unlikely as Naxos is a savvy record label that has been vocal about poor treatment of classical music metadata on services. More likely someone (or maybe an algorithm?) at Google Play couldn’t decide if the composer or the performer was more important to display for this release, and just picked one randomly. It’s hard to know for sure. 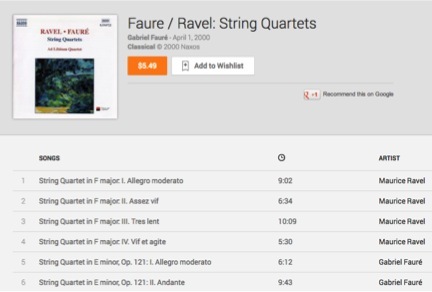 But it is clear that if Google Play had chosen to also show the “Composer” field, the source of this subtle–but significant– problem would be more obvious. Maybe if the problem was more obvious Google Play might have an incentive to solve it faster. As it is, it’s unlikely they are going to tell you anytime soon (with words) who played on this record. I’m not just picking on Google Play here. Here is the same problem on Rhapsody. 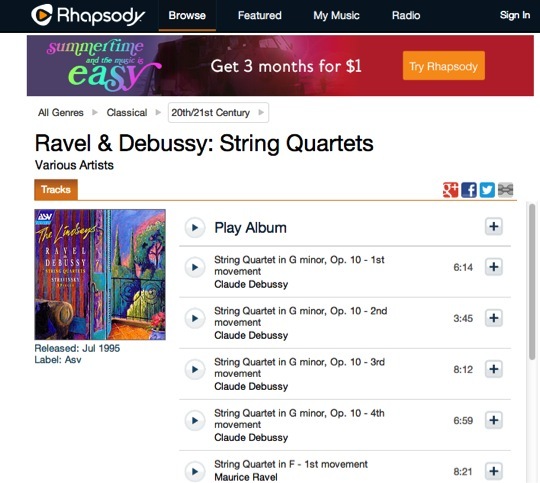 The image above shows that, for this recording, Rhapsody properly displays the composers on the track level – in this case Debussy and Ravel – but the performer is listed as “various artists”. There is actually only one group performing on the record, it’s the Lindsay String Quartet (sometimes referred to as The Lindsays). I figured this out after looking at the cover art and doing a little digging. If there is only one group performing on the record, why the “various artists?” The only reason I can think is that it’s possible Rhapsody thinks that Claude Debussy and Maurice Ravel are the performers on this record. Just to be clear (for those of you who may not be classical music fans), they are definitely not – both of them had been dead for over 50 years when this recording was made. There’s something else weird about this picture. I looked at some other classical recordings on Rhapsody and was surprised to find that they don’t seem to often display composers on the track level the way they do for The Lindsays’ album. It inconsistent and a little baffling. Rhapsody and Google Music inconsistently and alternately lists composers or performers under “artist” when it comes to classical music. And in situations like the examples above—which, by the way, took exactly two seconds to find—you often have to squint at the album art to try and figure out who the performer is. And when they do tell you who is performing, you can’t figure out what pieces they are playing. It’s frustrating and confusing at best, and a significant barrier to discovery of classical music in the digital marketplace. Specifically this example is about the problem jazz sidemen pose to services. Say you want to look at all of the records that jazz pianist Bill Evans played on. 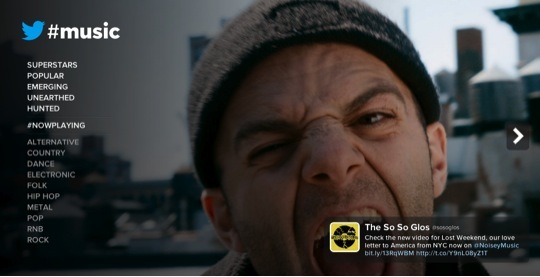 This is Spotify. 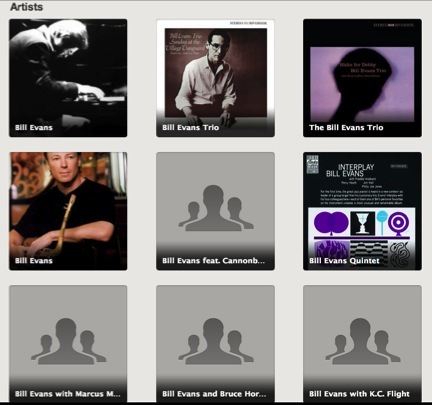 They have 31 different Bill Evans! Bill Evans feat. John Coltrane, Tony Bennett and Bill Evans, two different Bill Evans Trios… You have to look at each of these 31artists to see what albums are associated with that version of Bill Evans. But even after you do that, you won’t find this one. 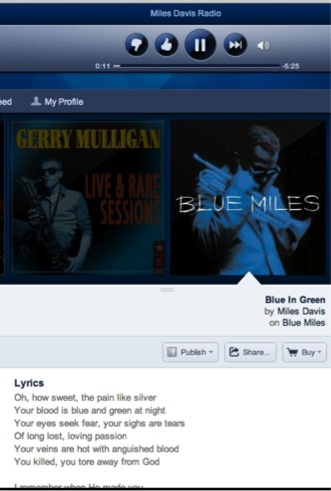 “Blue in Green” from the Miles Davis album, Blue Miles, was by most accounts co-written by Bill Evans and he is heavily featured on this track as a pianist. But while Pandora will tell you the supposed lyrics for this song (there are no lyrics to the song as far as I’m aware. I don’t know what that is about), it won’t associate Bill Evans with the track in any way. This is what that same album looks like in iTunes. …the sideman information is still not included with the metadata associated with the album. 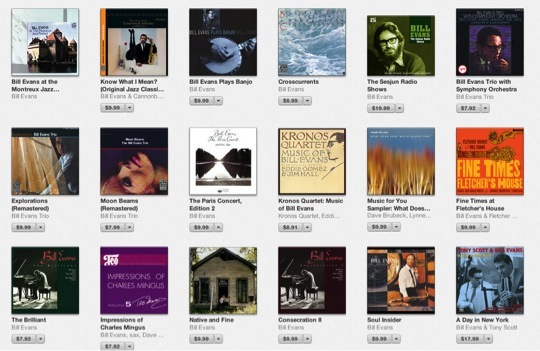 That means you cannot find this album by searching for Bill Evans on iTunes. 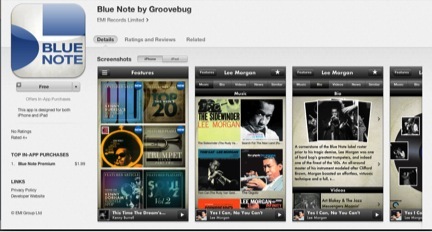 This is a screen shot of me trying to search for “Bill Evans” in iTunes. In the over 300 albums that come up, you will only find those where (a) Bill Evans is listed under “Artist” for a particular track or (b) where his name is in the title of the album. Not a single one of the 300 records that comes up when you search for Bill Evans is a Miles Davis record, even though he appears on over 20 releases where Miles Davis was a leader and was also an integral part of Miles Davis’ Kind of Blue record – arguably one of the most influential albums ever made. To be clear, this problem isn’t just about Bill Evans. In fact, it’s not even just about jazz artists. The same is true for any performer who plays in multiple bands, or situations where multiple artists play on the same record. 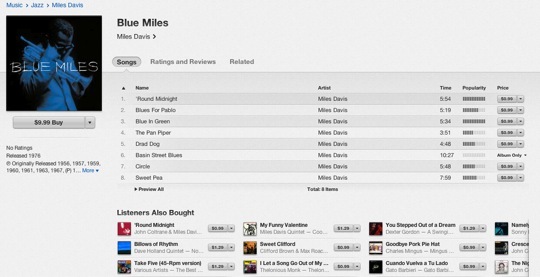 If you search for Miles Davis, you’re only going to find the albums where he is the leader or where his name is in the title of the album. So that means, with rare exception, you will not be able to find any of the 20 Charlie Parker sessions that Miles played on if you search on ANY major music service. So those are the two examples. To summarize: Spotify, Pandora, Google Play, Rhapsody and iTunes do not make a clear or consistent distinction between composer and performer when delivering classical music to music fans. Nor do they list sidemen on any jazz albums. These are infrastructure issues. These are metadata issues. These are dealbreakers for classical and jazz fans. And they make classical and jazz undiscoverable for new fans, contributing to the bigger problem of these genres’ “invisibility” in the marketplace. We can chuckle about this and point out that the average user doesn’t care about the semantic distinction between “composer” and “artist”; they simply want to find Beethoven’s music when they type it in the search box—who cares who played it? And most people are really only interested in Miles Davis—who cares about every single person who played on that record? But for me, this signals trouble down the line. If these services can’t get who played or wrote what straight, what assurances do we have that these performers and composers are actually getting paid accurately for digital sales and streams? How do we know SoundExchange isn’t getting reports that Beethoven was the performer on a webcast, and what confidence do we have that Spotify knows which composers they should be paying when they won’t list them? Classical and jazz fans are slower to adopt to new online services because, quite simply, these services are not built for classical and jazz fans. Spotify, Pandora, Google Play, Rhapsody and iTunes. No major music service is exempt from this problem. They won’t tell you who the sidemen are for jazz. Sometimes they won’t even tell you the performer/recording group for a classical piece. This is one of the many chicken and egg situations I’ve observed when it comes to jazz & classical genres and the music industry. It is a critical mass problem: If you don’t have enough people who care about the distinction between the composer and performer (as one example) involved in building these services and structures, the resulting platforms will be built without the necessary information needed to serve jazz and classical audiences. Missing or bad data and non-searchable fields lead to shoddy user experiences. jazz and classical fans will keep away from these services. And without a critical mass of fans using a platform, services can’t justify investing time or money on these kinds of problems. It’s a cycle that won’t be broken without intervention. And in doing so, jazz and classical end up isolated from the rest of the industry. Again. What happens when a group or perspective is consistently left out of a story? Sometimes the industry forgets they’re there. The most recent example of this continued isolation of classical and jazz is Twitter Music. Has the cumulative effect of poor visibility of these genres led a huge service like Twitter to decide that they aren’t worth including as searchable genres? The metadata issue is one that FMC has been tracking for many years. We’ve spoken with representatives at online platforms. We’ve talked with aggregators. We’ve attended metadata summits (yes, they exist). We have convened meetings within the jazz and classical field to hear their concerns. And we’ve organized panel discussions at our own events to shed light on the ongoing challenges. It’s time to kick this conversation to the next level; join us at the Future of Music Summit in Washington, DC October 28-9 for a deeper conversation about metadata and music.